Culture, technology, and services are evolving fast, in exciting, and unexpected ways. That's putting great pressure on ad agencies to be quicker, sharper, and go deeper to create greater value for brands. So how do they evolve to meet this challenge? Here are five things that agencies can do right now to ensure relevance. Stop 'staying busy' and retool for speed and accuracy now.Reflecting the impatience of our times, clients are hungry to see rapid value from agencies. They want to see what bang they're getting for each hard-earned buck. So agencies must rearm to work efficiently, but also to add more value rapidly. That requires being equipped with nimble structure, while preserving creative freedom. "Staying busy" happens when agencies don't have clear, objective, and easily adaptable methodologies in place. Whether it's generating new ideas throughout the project life cycle, or creating brand frameworks responsive to a more empowered customer, agencies need to retool now for speed and accuracy. Even as they chase surprise and delight, enabling teams with structured but nimble ways to quickly understand how the dots are connected means they will spend more time beyond the tablestake, where real value (and delight) gets created. Educate people out of silos.Agencies don't invest enough in teaching teams how to problem solve. People are left to figure it out on their own, which can lead to risk aversion and group think. Teaching teams how to use the frameworks and techniques in the agency toolkit gives them confidence, and familiarizes them with the box they need to think out of. This allows for a more 'guided' implosion of silos. And people need this encouragement to hone their ability fast. Balance design thinking and lateral thinking with freeform creativity.Agencies need to adopt design thinking to give greater gravitas to the creative process. It's not about being pedantic; it's about ensuring that views are informed by both feelings and facts. Feelings become infinitely more powerful when they are backed by objective, rational analysis, not just subjective opinion. Design thinking allows for rapid understanding and modeling of insights through techniques like empathy mapping, shadowing, etc., and iterates towards perfection. On the other hand, Edward de Bono's "Six hats" is an example of lateral thinking. It forces each team member to think from many unique perspectives, or hats, getting to actionable insights quickly and thoroughly. These techniques are intended to make discovery and problem solving an informed and accountable activity, while preserving space for gut and intuition. To agencies used to a free-form approach these can feel awkward the first few times. But as a habit they become liberating experiences. Create a culture of wild ideation.Agencies need to adopt ideation as a value-added activity in itself. Most of the time ideation happens only on client projects. But agencies need to start investing in ideation as a wild, free form activity independent of their work. Give all your amazing thinkers and creators theoretical problems to solve so that teams are always exercising their mind-muscle and staying in an ideation mindset. Institutionalize creation of ideas and points-of-view, and everybody within the agency should be empowered to participate, not just people with 'creative' in their title. What differentiates agencies, or team members, are the crazy ideas they dream up and then realize in the proper context. Open the windows and let your environment in.It is crucial that agencies tap into the world of brilliance that surrounds them. We live in fast-paced, innovative times, surrounded by revolutionary ideas bubbling up in every corner of the world. Creating meaningful partnerships with companies and people outside of the agency, and allowing the agency culture to absorb inspiration from external sources is critical. My office is based in the middle of the San Francisco technology gulch-fiercely technological, competitive, and full of ideas--San Francisco is the first place where new technology and ideas get tested and launched. The bars and coffee houses here buzz with inventive energy. For an agency to thrive in this environment, it must participate in and feed from that energy, as we do. This energy would be very different if we were in New York, LA, Chicago, or Philadelphia. By participating in and reflecting the environment that surrounds us, we bring greater value to our work. For decades, people have said that ad agencies are headed towards obsolescence. Today, with the ubiquity of new channels, platforms, & media, and savvy customers, that message is being heard more than ever. However, advertising continues to be a cultural arbiter and morphs with the times to find relevance and thrive. It's never 'game over' for advertising, but agencies must respond to new cultural realities constantly. Meeting challenging expectations and delivering greater value to customers who are demanding better, smarter, deeper answers is the new cultural reality. To stay relevant, agencies must make genuine change happen from within, and allow teams to find joy and thrive. 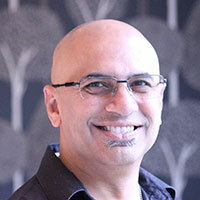 Vineet and his team partner with client brands to mine audience insights, articulate transformational journeys and touch points, brainstorm ideas, and push conceptual boundaries to achieve business objectives. Before joining the San Francisco office, Vineet led Digitas Health LifeBrands' creative offer in Europe, influencing strategy for global clients. While in London he helped to launch the DHLB brand in the EU, and grow the agency's profile with multiple major award wins, such as Cannes, AdAge, Mashable, The Drum, Clios, OMMA, Communique, PM360, and The Creative Floor, among others. His work has been highlighted at TEDx, WHO, and the United Nations.